We've seen it photographed, videotaped, and even, briefly, up on RIM's own website. 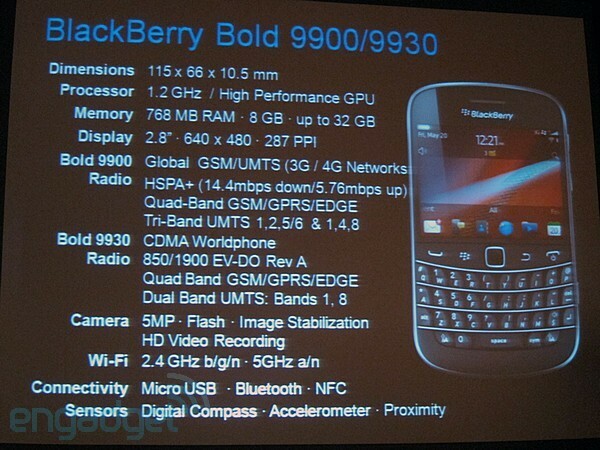 Now it's up there to stay, the BlackBerry Bold 9900 and 9930 (aka the Bold Touch) have been made official as RIM kicks off BlackBerry World in Orlando. As expected, the phone packs a 1.2GHz Snapdragon processor that has only a 2.8-inch VGA touchscreen with a 287dpi pixel density to worry about. On the back is a five megapixel camera and inside is 8GB of internal storage (with microSD expansion) and NFC circuitry. At 10.5mm it's RIM's thinnest handset yet, featuring a stainless steel circumference and a fiberglass back, while up front of course it makes room for a full QWERTY keyboard. The 9900 supports HSPA+ connectivity to get its 4G on, while the 9930 is the world variant, adding dual-band CDMA and quad-band GSM to the mix, and both do 802.11a/b/g/n along with Bluetooth 2.1. Both, quite naturally, include the new BlackBerry 7 OS, including a faster browser and voice-activated search. Another picture and full specs are listed after the break, which will have to do you until this handset releases sometime in the summer, meaning this could be your next great beach accessory for those working vacations. Update: Full press release and more images after the break. Waterloo, ON - Research In Motion (RIM) (NASDAQ: RIMM; TSX: RIM) today unveiled two new BlackBerry® Bold™ smartphones. The high-performance BlackBerry Bold 9900 and 9930 smartphones feature a stunning and iconic design that integrates an incredibly easy-to-use BlackBerry keyboard with a brilliant, high resolution, capacitive touch screen. These exceptional smartphones are built on a new, performance-driven platform powered by the BlackBerry® 7 operating system and designed to deliver the ultimate in communications, multimedia and productivity for users around the world. "The new BlackBerry Bold smartphones and BlackBerry 7 OS are inspired by millions of customers around the world who want the ultimate combination of performance, functionality and style," said Mike Lazaridis, President and Co-CEO, Research In Motion. "These fully-loaded and beautifully crafted smartphones offer a highly refined user experience with blazingly fast performance, a brilliant touch screen and an outstanding typing experience." Thin, Sleek, Iconic Design Distinguished by an iconic design and the industry's best keyboard, the BlackBerry Bold 9900 and 9930 smartphones feature the premium materials and finishes that characterize the BlackBerry Bold line. Both models have a lustrous exterior with a brushed stainless steel frame and a high-gloss glass-weave backplate. They are also the thinnest BlackBerry smartphones yet, at only 10.5mm. The quality materials and optimized design of the new BlackBerry Bold smartphones are instantly evident when held in the hand. The Liquid Graphics touch screen, a key new feature powered by BlackBerry 7, delivers fast, smooth performance for highly responsive touch-based navigation, web browsing, pictures, video and graphics intensive games*. Offering up to 60 frames-per-second performance with instant UI action/response, Liquid Graphics gives customers a visually rich and immersive experience that's responsive to the touch. In addition, the smartphones feature brilliant displays with an eye-popping 287 dpi to deliver crisp, stunning visuals. Augmented Reality The BlackBerry Bold 9900 and 9930 smartphones feature a built-in compass (magnetometer) to support location-based services and augmented reality. APIs will allow third party developers to take advantage of the new functionality within their applications. The new smartphones will also include Wikitude, the leader in mobile augmented reality, which overlays contextual information on what the user sees through the smartphone's camera viewfinder. With BlackBerry 7 on the BlackBerry Bold 9900 and 9930 smartphones, users will also get the full version of Docs To Go® with all "premium" features enabled out-of-the-box so that users can easily work with Word, Excel and PowerPoint files directly on the smartphone. Docs To Go also includes a native PDF viewer.